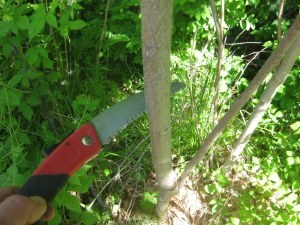 First, cut 12 thin trunks of sumac; you need nothing more than a pruning saw to sever the soft wood. Next, arrange a tripod at each end of the bed, as illustrated above. 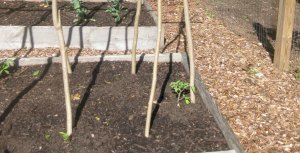 Simply plunge the trunks into soil, to a depth of 6-12 inches. 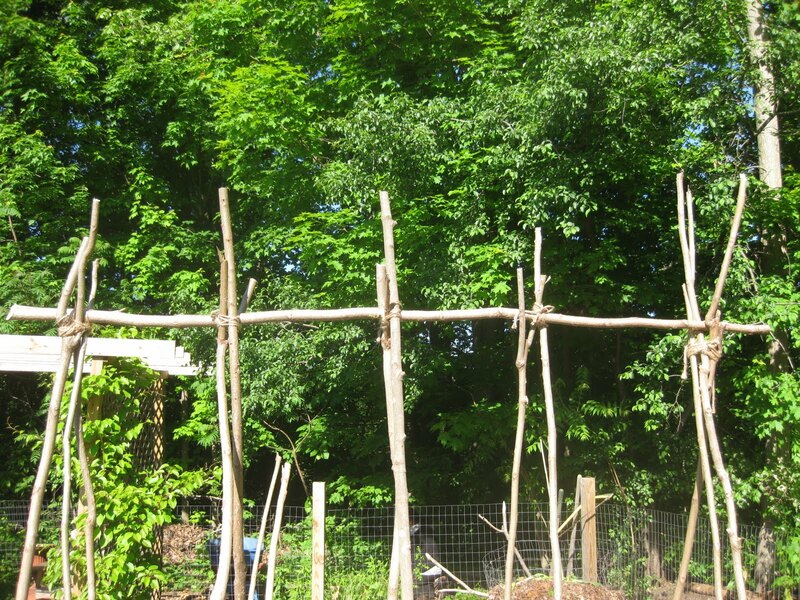 To make a cross-beam, simply lay a piece of sumac in the crotches of the two end-tripods. 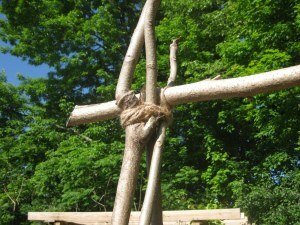 Finally, criss-cross two trunks at the center of the structure, and lash them in place. Do the same for the remaining pieces, at equal intervals between. 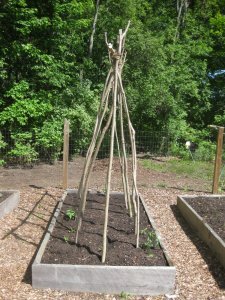 Anchored in soil, and lashed with jute-twine, this super-duper trellis is sturdier than the stoutest wire tomato cage on the market. 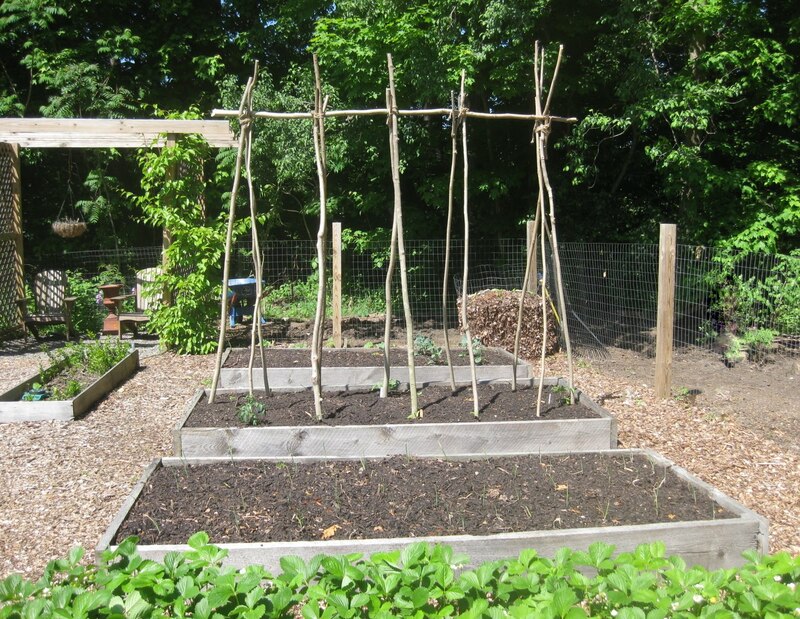 And indeterminate tomatoes aren’t the only crops that will climb its rustic frame — pole beans, cucumbers and heavy winter-squash will, too. Wow, what a great use for sumac! 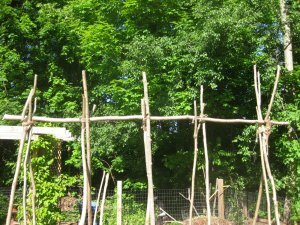 Can't wait to see what the structure looks like when it is covered with tomato vines. 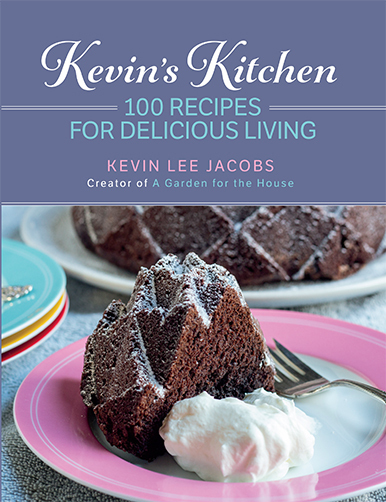 Love your trellis, Kevin! So…Adirondack! And like Justin said, a great use for sumac, which grows in abundance here in the Midwest, too. 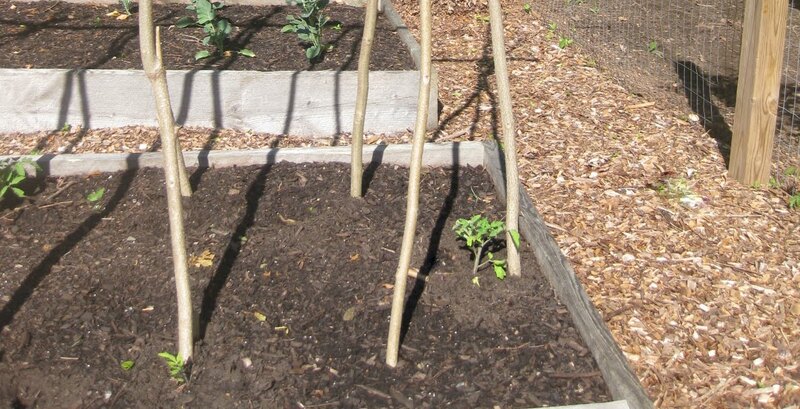 That trellis will look like a green skyscraper once the tomatoes get going. I take it you didn't use poison sumac! Phoebe – From what I've read, poison sumac is actually pretty rare. It grows almost exclusively in bogs and other wet areas. Kevin, how tall are you? Will you be able to reach the uppermost tomatoes at 7 feet??? I was wondering the same thing as Gardenlady! 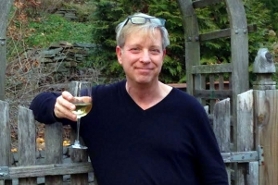 Gardenlady, Eric – I'm 5'8″. 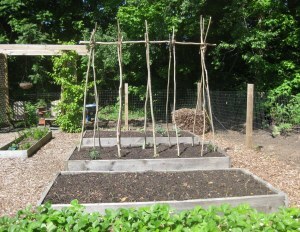 I plan to stand on the edge of the raised bed to harvest the “high altitude” tomatoes! Not trying to make you jealous but………..here in Charleston, South Carolina we have been blessed with a very early and long growing season. My seed started tomatoes are already a foot tall outside. The asparagus, newly planted, has peeked out of the dirt and already has two ferns and I picked my first ten strawberries yesterday morning. Love your newsletter. It inspires me. Dear Anonymous: you have indeed made me VERY jealous! And by the way, I adore Charleston, SC, and used to visit every April. I'd live there if I could! Early blight ruined my plants last year and so far already seeing spots on lower leaves. YIKES!! I didn’t know sumac ever grew to 3″ in diameter. I like your trellis.